The 9 Emperor Gods birthday is one of the most important events in the Taoist calendar, as a full 9 day celebration takes place on the eve of the 9th Lunar Month in the Chinese calendar. It is a festival that is celebrated throughout South East Asia. It has always been intriging seeing these mediums get into a trance like state as they invoke the deities and eventually get possessed by them during the festival. Once possessed, their movements are graceful and reflects the deities that goes into their bodies. It can be scary, almost a supernatural realm to it, just standing there watching the procession. As such this article is mentioned. In this special period of the Taoist Religion, The 9 Emperor Gods are invited and welcome to Earth, and through these 9 days, a mixture of vegetarian meals, chantings and bells are common. It is also believed that in these 9 days, rain is common, as the deities are known to come through via waterways. After 9 days, the Emperor Gods are sent back home, via the water way, as processions will start from the temples and end off at sea shore or a river. In Singapore, it could be at a deserted part of East Coast Park near the beach or Kangkar River. 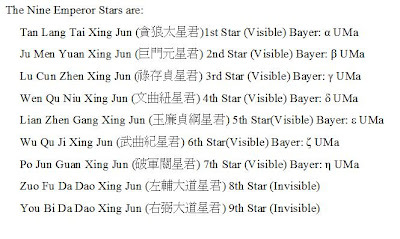 The 9 Emperor Gods are believed to dwell in the stars of the northern heaven under the reign of 'Thien Hou' - the Queen of heaven. They are believed to preside over life and death, blessings, peace and harmony on Earth. Thus in the 9 day celebration, it is a mix of celestial and terrestrial beings, as man worships the arrival of these deities on Earth. It is also rumoured that in these 9 days, rain are expected as it is this means of 'water' that these deities make their way down from the Celestial Heavens. Which kind of explains why these few days, there were indeed dispersed showers! But perhaps the highlight of the festival would be the piercings of some mediums, equivalent to Thaipusum, some of which looks ridiculously painful! So for anyone interested to check out the festives, do head down to any of the void decks that you notice an elaborate tentage area set up with lots of incense burning, this festival will last 9 days and at the end of it you will see an entourage of neon lighted trucks and lion dance clanging as the devotees send these deities back to the Heavens on the last day.